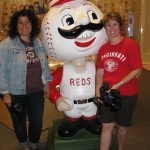 Two Moms and a Car – Cincinnati Day 6- Play Ball!! 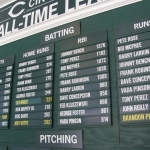 The next part was about the Pete Rose hitting record…4,192 hits making him the all-time Hit King! 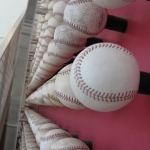 There is a 4-story wall of 4,256 baseballs representing each of his career hits. It is impressive! 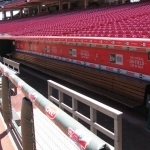 Just outside is the spot that his record-breaking hit landed in the former Riverfront Stadium. The spot is marked in the middle of a rose garden with a single white rose bush among the red ones. 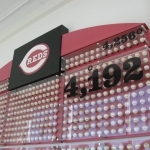 We continued up the steps to the museum level and began our venture into all things about Reds history. 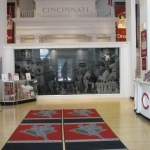 It is filled with tons of memorabilia chronicling the history of America’s oldest baseball team, founded in 1869! 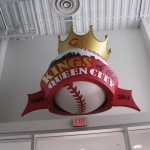 We learned about all the firsts that this ball club has had. They were the first to play a night game with lights, which increased their game attendance 400%! They were the first team to fly on an airplane as a team. 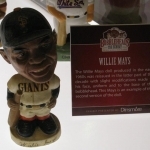 They had the first left-handed pitcher. They were the first to have an opening-day parade. 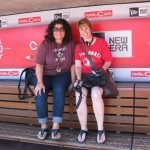 And… for all the moms out there… they are now the first ballpark to offer a moms’ nursery – a quiet place for moms with babies to go take care of their babies’ needs while still staying connected to the game! 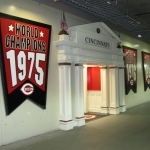 One of our favorite places in the museum was the Reds “super fan room.” It was designed to look like someone’s basement, complete with comfy chairs, a bar, a large screen TV, and tons of Reds memorabilia! 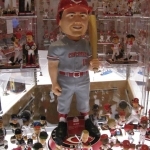 Toward the end is a sculpture of the big 8 from the Big Red Machine from the 1970s. This team has one of the winningest records in baseball! 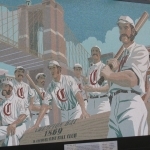 It depicts Pete Rose, Johnny Bench, Tony Perez, George Foster, Cesar Geronimo, Dave Concepcion, Joe Morgan, and Ken Griffey Sr at the 1972 National League championship win over the Pirates. Also in the room were the Reds’ 3 World Series Trophies. But wait, you say – the Reds won 5, not just 3! Ah, yes – prior to trophies, teams were awarded a huge pennant for winning! We proceeded into the actual Red Hall of Fame, which was a very well-done display of bronze plaques commemorating the best of the best for the Reds. 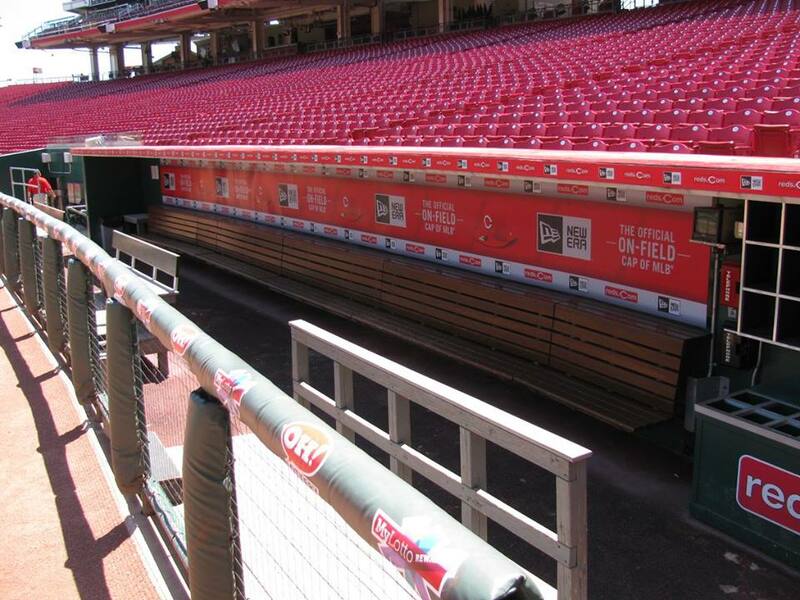 In about 2 weeks, this will be the site of much excitement as Pete Rose I inducted into the Reds Hall of Fame. The entire big 8 will be coming back for the event! Would love to see that! Our next baseball adventure was a stadium tour with our guide Bob. Assisting him were Mike and Rob, all huge Reds fans. We were able to tour through the special reserved seating areas and restaurants, and even got to go into the press room for a phenomenal view of the park! The highlight of this tour for us was getting to go right out onto the rim of the field, standing on the on-deck circle, and sitting in the dugout! Just a couple nights ago, we saw Joey Votto, Brandon Phillips, and Jay Bruce standing right there! Inside the dugout were cubbies labelled for each player to store their helmets and bats in. We were able to go down to see where the team enters the park, a great doorway that leads to the Reds Clubhouse, where the team has pitching lanes, a restaurant, locker rooms, and medical facilities. After we enjoyed a meal at Sammy’s Gourmet burgers, we returned to Hamilton. 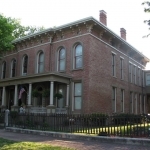 Aunt Gail took us on a driving tour of some of the town’s most historic districts, which were home to huge houses that looked like Victorian doll houses!! 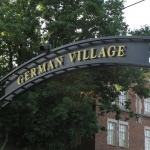 There even is an area called the German Village. 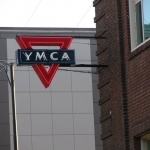 We noticed 2 super- vintage YMCA signs as we went through the neighborhood… Kevin at the sign museum would be proud! On Main Street, the beautiful architecture continues, and in the middle of it all, an impressive bronze sculpture of Alexander Hamilton stands to keep an eye on things! 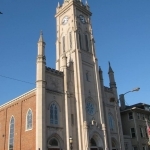 We have truly been amazed by the Cincinnati area… there was much more here to explore than we had even planned. 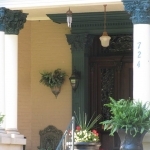 A true blend of Old World and Americana! 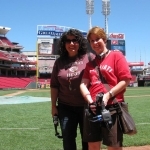 By Courtney Godsey|Filming, Food|Comments Off on Cincinnati Day 6- Play Ball! !